Please refer to our stock # TC388 when inquiring. 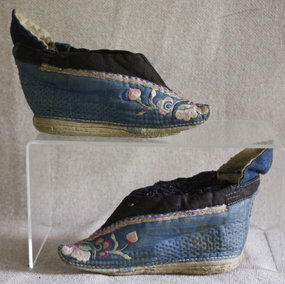 this antique pair of lotus embroidered lotus shoes are most likely from northern china. the vamp is a quilted cotton fabric. Each shoe is embroidered with the same floral design on both sides. The shoes were used and show some soiling on the vamp and the soles are slightly worn and dirty.